Clipindale's Salon Inc. opened its doors for business in April of 1999. Clipindale's Salon Inc. was the culmination of a goal by its owner, Dale Lue. 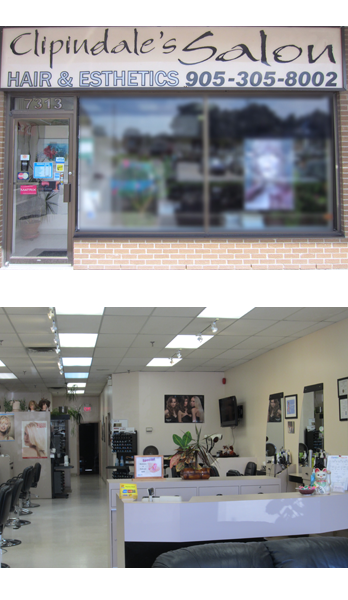 Dale's previous 20 years of experience, 8 years with the number one salon in Fairview Mall in the 1980’s and 12 years as co-owner of another salon in Scarborough enabled him to help with the design of Clipindale's Salon. Designed and built by Takara Belmont, one of the leading designers of beauty salons. Our experts provide a wide range of hairstyles which include colours, highlights, perms and straightening. We also provide full service esthetics to help you relax and achieve your optimal well being. Through continuing education we are able to offer you the latest and greatest in hair design. Each head of hair is a work of art, an expression of the artist’s talent and a reflection of the client’s personality and style. Lifestyle plays a big role in determining a hairstyle and functionality is always key. We never leave you hanging, our professionals can educate you on how to maintain your style at home until you come in for your next appointment. Our commitment is for you to feel well taken care of and make you look your best.